Santabus from Waterford Unified School District, photographed by Suzanne Bauer, director of transportation, appeared on Dec. 8 in downtown Waterford. 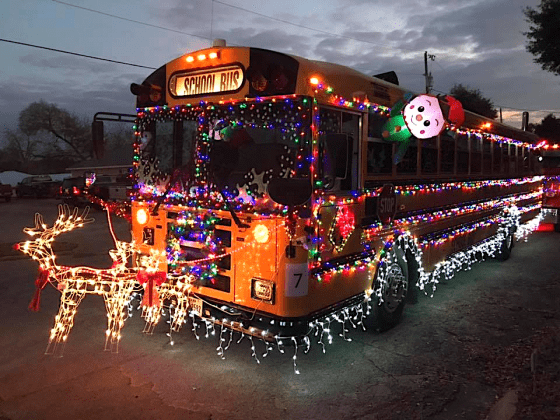 The city hosts a light parade each December, and this year, the school district entry won the brightest lights award, because they strung 6,000 bulbs. 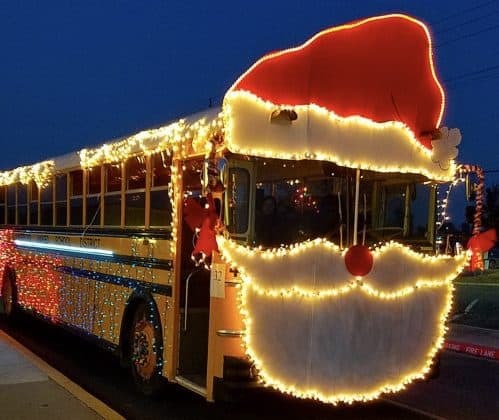 Our continuing article on decorated school buses has now officially entered the final stretch, with just days left before Christmas. We received more photos overnight (see below), and we are still inviting last-minute emailed submittals. Since decorated candy school buses are still appearing in Christmas light parades, why not send us your best photos to include in our fun article?! Especially any photos that feature play candy or anything edible! We especially like cookies, pumpkin pie, candy canes and anything with chocolate—but don’t forget the egg nog! Hot chocolate, too! Remember to keep your editor well-fed! 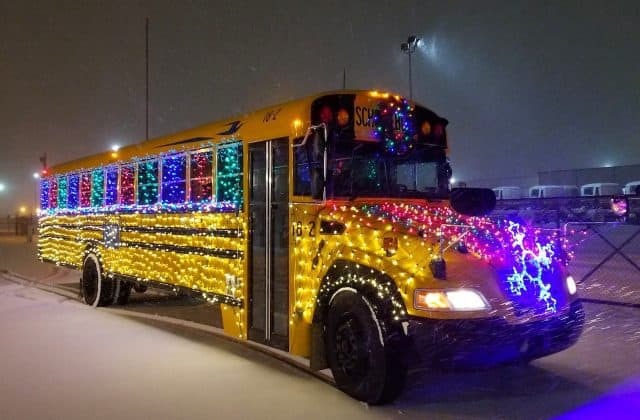 Readers have been steadily submitting their photos of the festivities to STN, for inclusion in this running article, which will be updated daily until the new year arrives. STN staff members are especially looking forward to seeing if there are any college football bowl game parades that will feature any outrageously decorated buses. 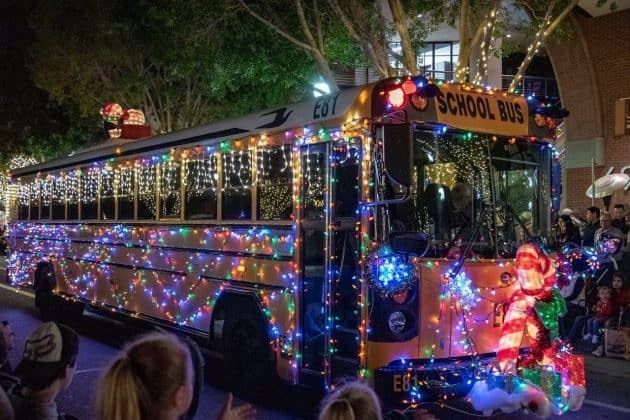 Holiday activities included a popular event held in early-December in Tempe, Arizona—the annual City of Tempe light parade, reported Jessica Palmer, director of transportation at Tempe Elementary District #3. 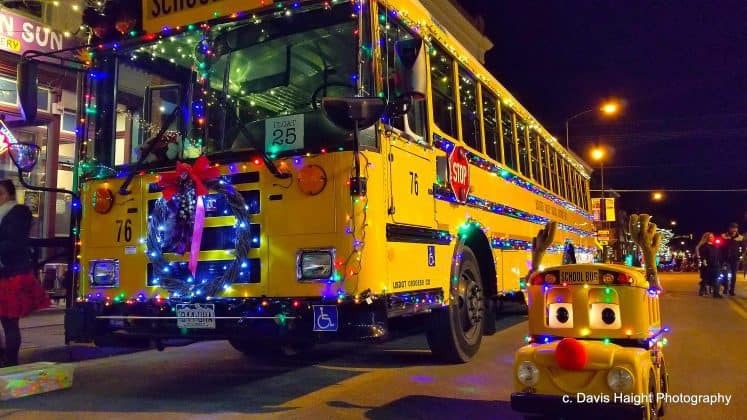 Other photo submittals included an entry submitted by the Student Transportation of America that drove on S. Broadway during the Santa Maria, California, Parade of Lights that was held on Saturday night, Dec. 1, 2018. 27J Transportation Christmas was submitted by Janice Singleton Kirgis, from School District 27J in Brighton, Colorado. An ex-school bus from Harrisburg District 3 in southern Illinois, is now privately owned. Buster the School Bus was all smiles during the popular Boulder Parade of Lights. 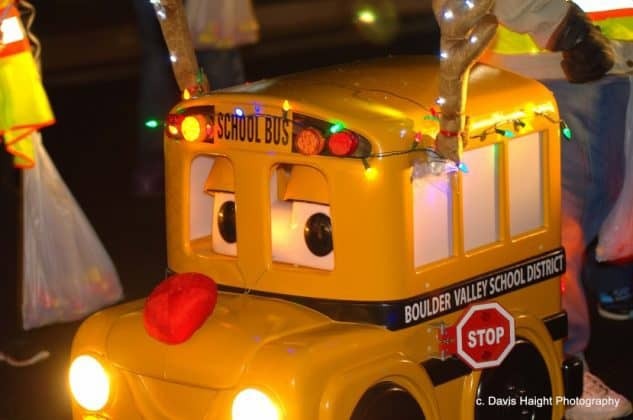 Philip May, transportation training specialist at Boulder Valley School District, submitted this photos by Davis Haight, taken at the Boulder Parade of Lights. 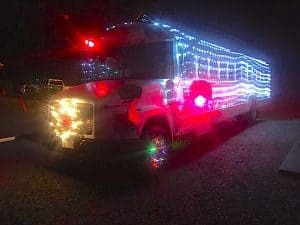 One of the more popular entries in the Boulder Parade of Lights. 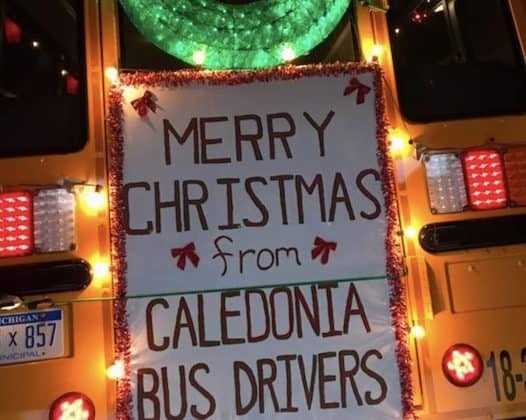 Caledonia, Michigan’s Annual Chamber of Commerce Night time Christmas Parade on Dec.1, featured this popular entry. 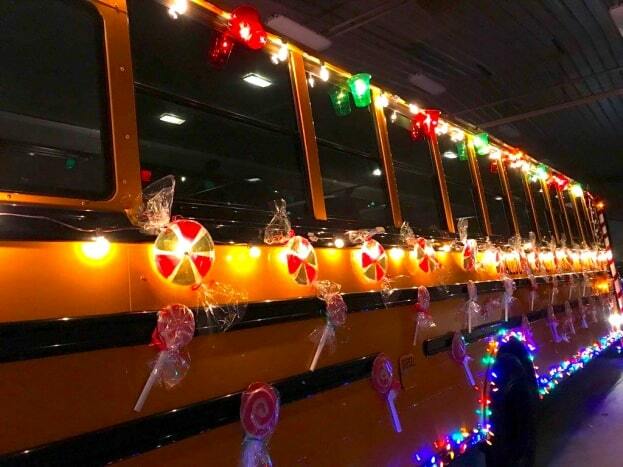 “Our drivers had a great time making the ‘Candy’ to help make our bus one Sweet Ride!,” commented Betty Nelson, who submitted this photo. 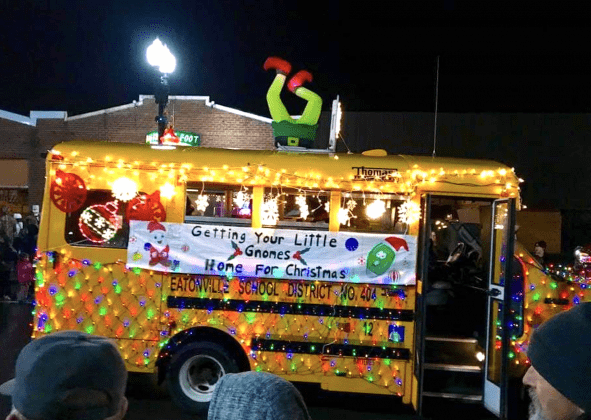 The Siloam Springs Christmas Parade in Siloam Springs, Arkansas, featured Christmas lights and artwork by their kindergarten students and high school art class. Kenny Thurman, fleet manager, said the kids had a ball making the artwork. “This year the theme was, ‘Over the river and thru the woods to Siloam Springs we go,’” he reported. Caledonia, Michigan’s Annual Chamber of Commerce Night time Christmas Parade on Dec.1, featured this popular entry. Photo by Betty Nelson. 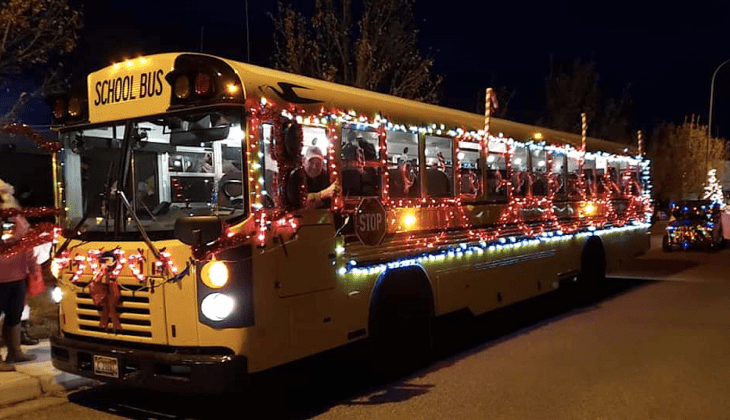 The Idaho Falls Christmas bus was prominently featured in the City of Ammon’s Parade of Lights on November 24. 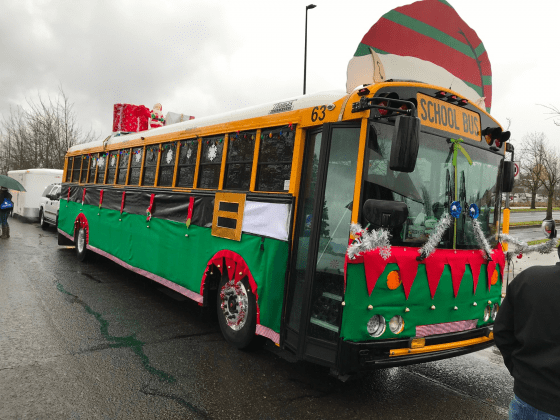 Mike Schlosser, transportation and fleet operations manager for Springfield Public Schools, submitted his photo of their school bus from the Springfield Oregon Christmas Parade, aka: the Oldest and Coldest Christmas Parade in Oregon. The Student Transportation of America entry rolls on S. Broadway during the Santa Maria, California, Parade of Lights that was held on Saturday night, Dec. 1, 2018. 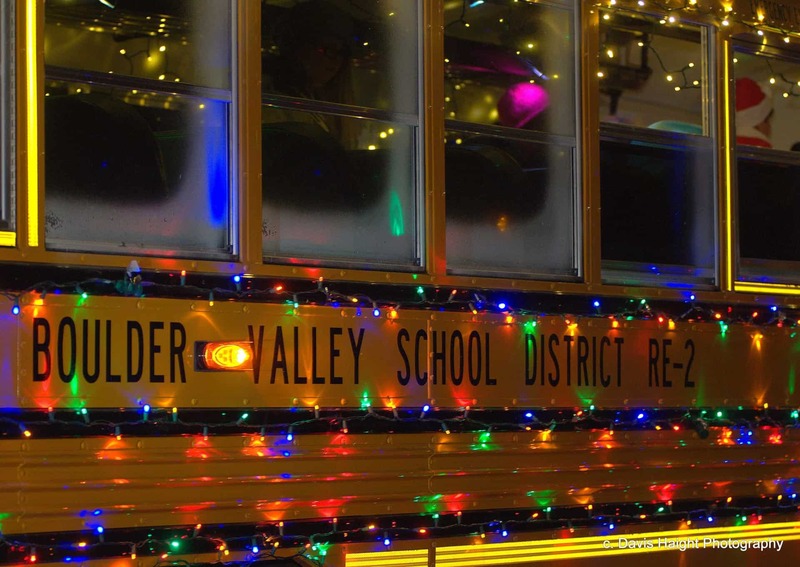 Even the bus wheels were decorated with candy-colored pinwheels and lights. Photo by Len Wood, Santa Maria Times. The Mojave USD entry in the 4th Annual Magical Boulevard Christmas Parade, held on Dec. 1 in the City of California City. Photographed by Daniel Welling and submitted by Tom Altman, director of transportation. 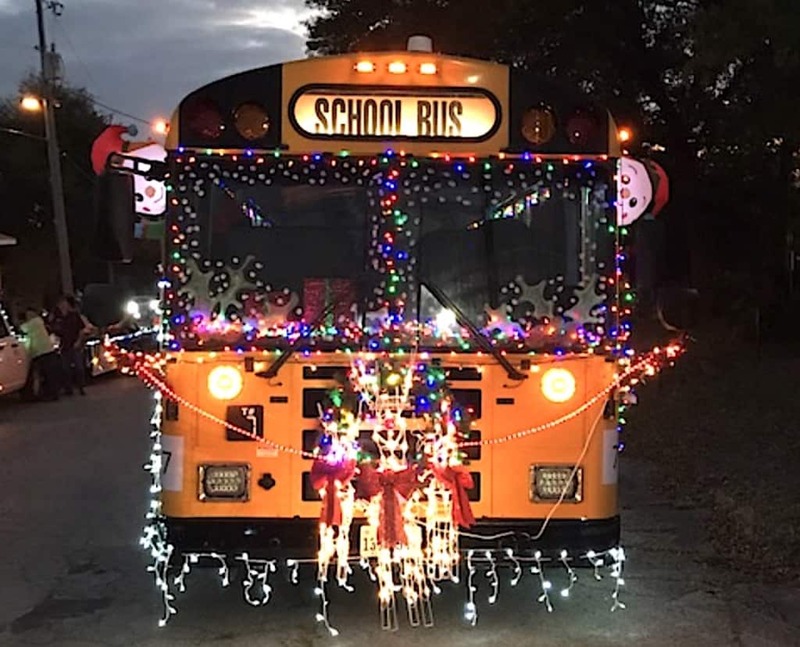 Cody Cox with Belleville ISD in Texas submitted this entry. He was one of STN’s Rising SuperStars in 2018. Looking slightly cold but highly fashionable for the season is Katrina Falk, assistant director of transportation at Shelby Eastern Schools in Shelbyville, Indiana. 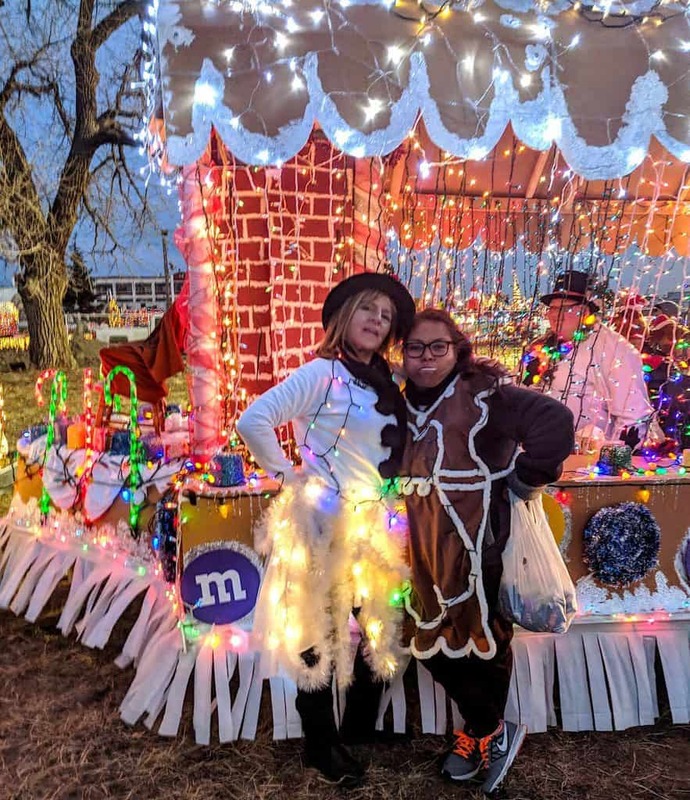 Jessica Palmer, director of transportation and safety at Tempe Elementary District #3 in Arizona, sent in this sparkling photo that was shot during the annual City of Tempe light parade. 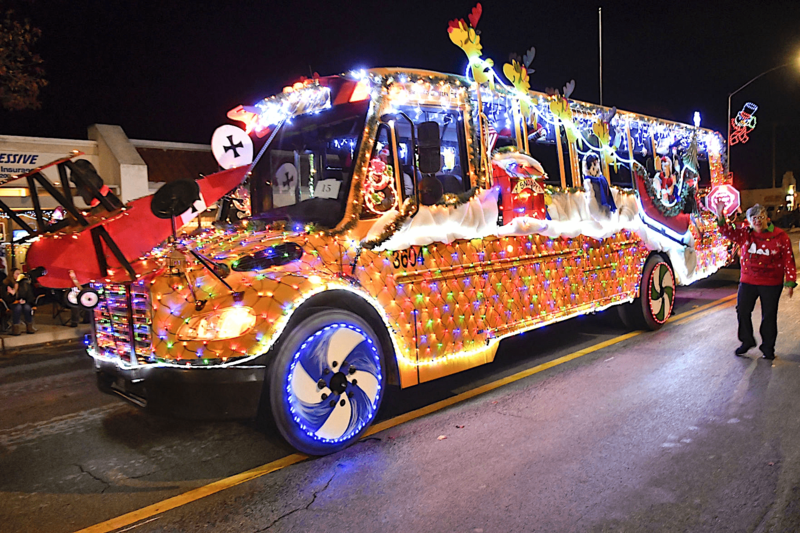 A holiday parade bus in chilly Michigan is sporting about 4,000 sparkling lights this year, said Kathy Vance, transportation supervisor for Charlotte Public Schools. 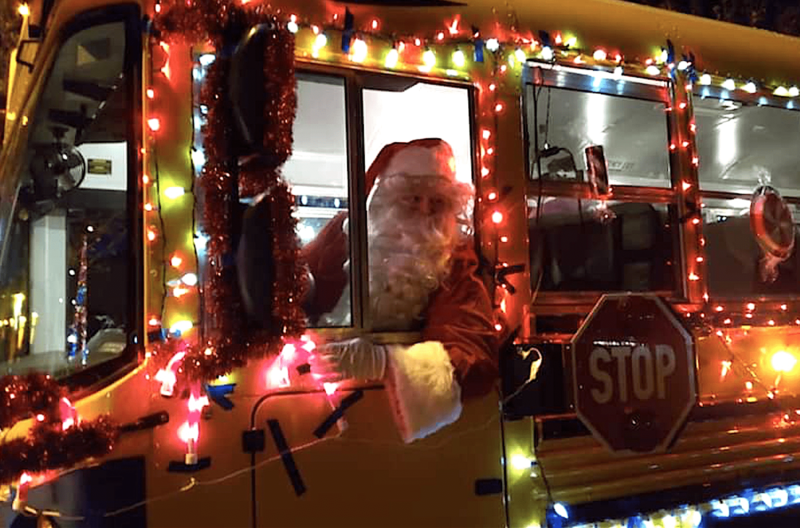 Santa arrived just in time to drive the Idaho Falls Christmas bus in the City of Ammon’s Parade of Lights on November 24, reported Daniel Lewis Transportation Special Needs Manager, Bonneville Joint School District #93. Gnomes made an unexpected appearance for Eatonville School District in a bus that was decorated by the transportation department, reported Katey Critel, transportation secretary, PSE Eatonville Chapter VP. 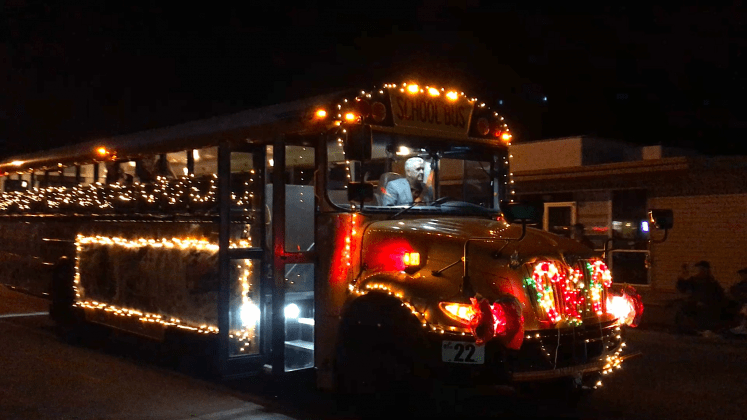 The town of Eatonville Annual Christmas Parade was Dec 1. 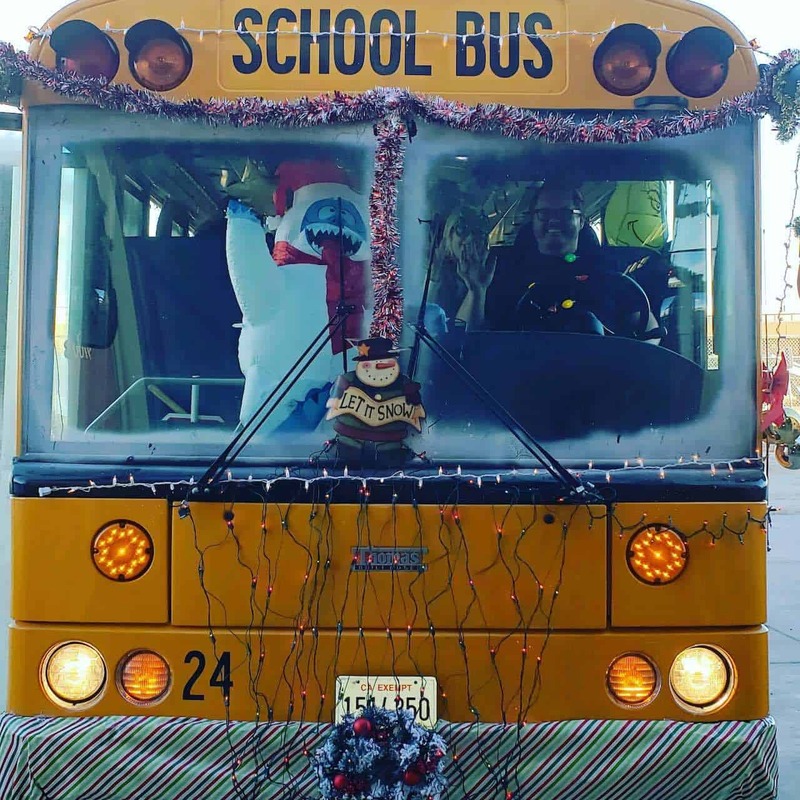 Cody Cox, director of transportation & fleet services at Bellville I.S.D. in Texas, submitted this photo from Bellville’s annual “small town Christmas parade” on Nov. 30, and also in the Sealy, Texas, Fantasy of Lights Parade and San Felipe Christmas Parade, on Dec. 1. 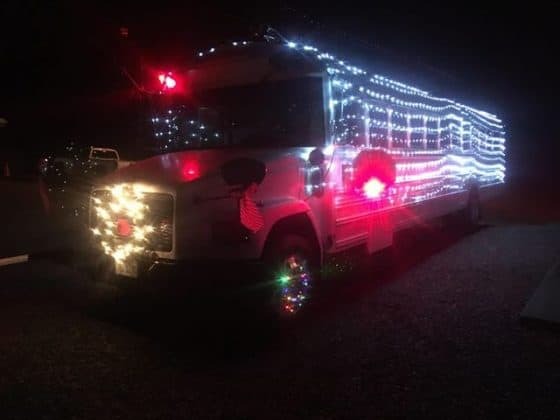 The bus played Christmas music and was decorated with more than 5,000 lights. Austin Evans owns and decorated this bus that used to belong to Harrisburg District 3 in southern Illinois.